Israeli occupation Defense Ministry announced, Sunday, that it signed a deal with the United States to purchase more F-35 fighter planes for the Israeli air force, at $110 million dollars each.The transaction, according to the Palestinian News Network (PNN), adds another 14 F-35 warplanes, with the option for an additional 17 aircraft, on top of the 19 placed on order in 2010. The whole deal is worth $2.82 billion, and supports high-tech aircraft, therefore will boost the US air industry. 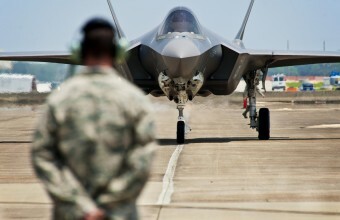 The first F-35 aircraft is due for delivery at the end of 2016 and the rest by 2021. According to Haaretz, the Israeli Air Force will receive a total of 33 F-35 planes. One of the acquisitions will serve as an experimental aircraft. The first two planes are scheduled to be delivered in about a year and a half, by the end of 2016. The rest of the aircraft are expected to arrive by 2021. The deal requires Israeli weapons to be integrated into the aircraft, in addition to the F-35 wings developed by the Aerospace Industry and the pilot helmets developed by Elbit.